STAYED TUNED FOR OUR NEXT EVENT! Harlem Country Auctions is a series of catered events serving up delectable noshes, specialty cocktails, live entertainment a no reserve auction with an eclectic mix of items at prices you’ll love — starting at just $1 . Our flagship event on June 28th, 2018, was a big hit, and we’ll be announcing our future plans here. Each event starts with a preview that takes place from 4:00pm–6:00pm the day of. At 6:30pm, the party starts and includes a variety of live entertainment, food and drinks, and a no reserve absolute auction of over 150 items selling in a range from $1–$3,000. It all takes place in our beautiful outdoor sculpture garden. The unusual mix of auction items have been acquired or commissioned to sell by Demolition Depot / Irreplaceable Artifacts™ during the course of business as pioneers in the architectural art reclamation trade. With over 150 rescues per year, founder Evan Blum has recognized that many superfluous leftovers (unrelated to the masterworks of architectural ornament he saves) would be sent to landfills. Blum has collected and stored a significant inventory, which is now being offered for sale through Harlem Country Auctions. To make purchases even more enticing, we have instated a low 10% buyer’s premium. Item shipping is available. 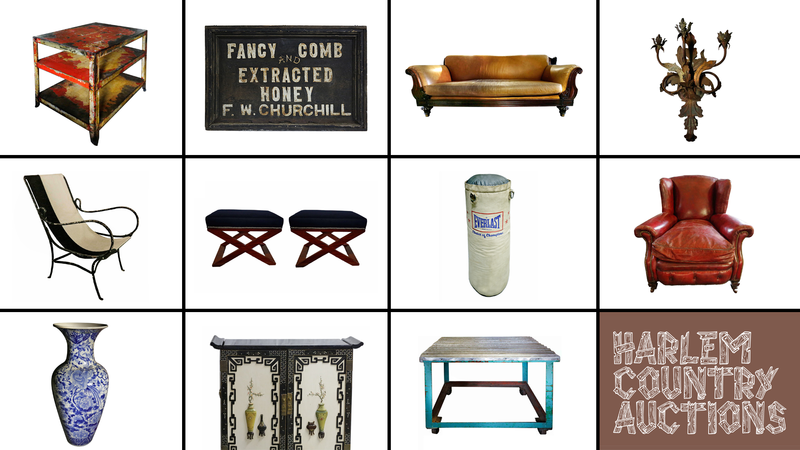 Harlem Country Auctions was created as an offshoot of Demolition Depot / Irreplaceable Artifacts™ to reduce the number of usable items that end up in the waste stream. It is critical to reverse the effects of our current throwaway society as our landfill space reaches maximum capacity and will create a hardship for future generations. The new auction service will sell a general line of items from modern and antique building contents, collections, accumulations, art, antiques, furnishings, equipment, tools and more. It will also bring energy and excitement to East Harlem while contributing to the creative economy in an important and sustainable way. The Demolition Depot and Irreplaceable Artifacts have shaped the landscape for the reuse of architectural ornamentation and preservation. Irreplaceable Artifacts is considered by many the leading reclamation and rescue operation, offering the finest in architectural ornament and antiquities to architects, interior designers, and others who long to add something special to their live and work spaces. For more information please visit DemolitionDepot.com and IrreplaceableArtifacts.com or call 212-860-1138. MF Events NYC is a catering and production company that specializes in production design and décor in unusual locations, catering and staffing, sponsors and promotional partnerships, and licensing and permitting. For more information, please visit: MFEvents.nyc or call 917-974-8825.